William P. “Skip” Smith Jr. ’79, 56, of Tallahassee, Florida, entered Chapter Eternal on September 4, 2017, after a courageous battle with cancer. Skip was born on September 7, 1960, in Tallahassee to William P. “Skipper” Smith and Ann Carlisle Smith. He married the love of his life and devoted partner, Sharon Cook Smith, on August 15, 1998. After graduating from North Florida Christian School in 1978 and the Florida State University in 1982, where he majored in accounting and finance, Skip began his banking career with Tallahassee’s Barnett Bank in 1984. After 14 years in small business and consumer lending roles, Skip joined Capital City Bank in 1998 and made countless contributions to the institution’s business banking area while rising through the ranks. The consummate professional, Skip was well respected for a banking expertise accumulated from more than three decades in the industry and an unwavering standard of service that quickly became his trademark. Skip was every bit a skilled and accomplished banker, but his life’s resume contains so much more than professional achievements. One of the traits that stands out most when remembering Skip is his heart, because it could be seen in everything he touched. He was endlessly kind and generous beyond measure. Everyone, whether client, family member, friend, or one of the thousands of members of the community who benefited from Skip’s passionate philanthropy, got Skip’s best. He held back nothing. Skip was a member of the Jackson Masonic Lodge and Marzuq Shrine Temple of Tallahassee, where he was devoted to helping raise funds for the Shriners Hospitals for Children. For 20 years, he served on the board of the Florida Sheriffs Association Committee of 99, which honors outstanding service among deputies and officers. He was also recently appointed by Sheriff Walt McNeil to the Citizen Advisory Council. Among his greatest passions was Alpha Tau Omega, with which he served many years as an advisor for Epsilon Sigma Chapter and on the national level. Skip was also a member of the board of trustees for the Epsilon Sigma Chapter and served as treasurer of the House Corporation. 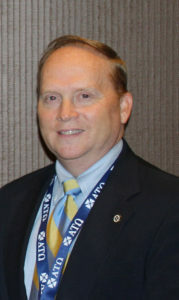 He served on the National ATO Foundation Board of Governors. Skip is remembered by several generations of ATO undergraduates as a mentor, advisor, friend and role model. For all these efforts and more, he was chosen by Capital City Bank as the recipient of its Julian V. Smith Award in 2005, which annually recognizes one associate within its ranks who exemplifies an extraordinary spirit of community service and generosity. He was also an active supporter of the local business community as a member of the Tallahassee Chamber of Commerce Board of Directors and related committees, and a Leadership Tallahassee Class XII graduate. A long-time supporter of the Tall Timbers Research Station, he was an avid and accomplished outdoorsmen who loved quail hunting. Skip was an active member of First Baptist Church of Tallahassee, where he served on the finance committee for many years. His faith was reflected in all areas of his life. In every way possible, Skip was an example to all who were fortunate enough to watch him work—both within the walls of the Bank and out in the community. The legacy he leaves behind will continue to inspire others for many years to come. Skip is preceded in death by his father William P. “Skipper” Smith and his mother Ann Carlisle Smith. He is survived by his beloved wife, Sharon Cook Smith; precious sister, Becky Smith Liner; adored nephew William “Will” Thomas Liner; and cherished uncle, Elzie Smith; as well as numerous family members and countless friends. Excerpts taken from Tallahassee Democrat article from September 6, 2017.